When it comes to understanding clothing promotional products & branding GoodGear has a wealth of experience. 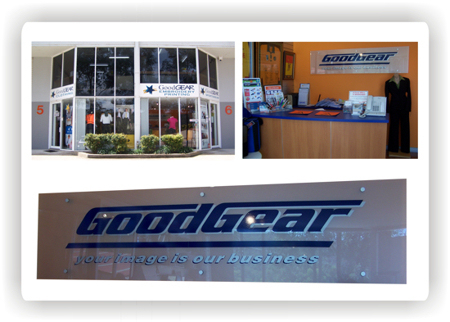 GoodGear was conceived in 1990 by the principals Michael & Jacqui O’Callaghan. Both of whom had many years of retail & branding experience. We were initially an embroidery company(called Embroidery Specialists) catering for the fashion houses and corporate branding suppliers for larger corporation’s in the Sydney market. Using our extensive knowledge of branding we expanding into clothing and promotional product and the company then became rebranded as GoodGear . Marc joined as IT consultant and since then has been a great asset to the team. GoodGear have in depth knowledge of all aspects of this business. From manufacturing of clothing to an extensive knowledge of branding, off shore sourcing and local manufacturing. We have done it all, so you can be assured of the best advice in choosing and branding quality products at an affordable price. We are supported by our wonderful team Karen Dyer in sales & sales support and graphics as well as Kim our additional graphics and digitizing expert. Nichole & Kirstin Dorn are our ultra-efficient sales support team and Lynn Moore is our very courteous and helpful receptionist. We are all backed up by our very competent production team, Jane, Diane, Mitchie, Sharon and Beth. Plus our great WorkWear Express Team Tracey, Sharon & Karen. 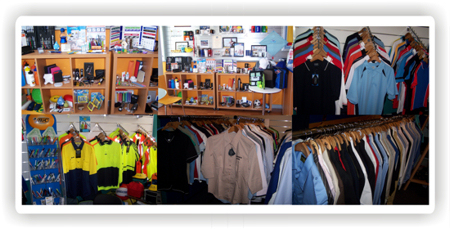 Work Wear Express is our corporate uniform and work wear branch at our second location in East Gosford. Good Gear is 100% Australian company. We strives to be environmental conscious and give back to the greater community. Over the years we have supported and continue to support many worthy causes and charities. Come on in to our showroom any time, we are open Monday to Friday 9am - 5pm. In our fantastic showroom we pride ourselves in collecting the most popular, unique and widest range of promotional products and uniforms. Our clothing ranges from polo shirts, t-shirts, singlets, shorts, and sportswear. We have a large range of corporate business shirts for men and women and also suiting like corporate jackets, skirts and pants. Our promotional products range in our showroom from caps, bags, low cost give aways, pens, mugs, waterbottles, exectuve gifts, keyrings and many many more. Drop in any time and a promotional product specialist will be down in an instant to help you with your next promotion or uniform solution. Every product we brand reflects our obsession with quality. Our philosophy is that only the best will do. Goodgear is a dynamic team of professional merchandise specialists. We combine fresh, innovative and creative thinking with extensive experience in manufacturing and product sourcing both within Australia and internationally.